Amazon, Apple, Facebook, and Google are the four most influential companies on the planet. That cannot be debated. Their longevity however can be. 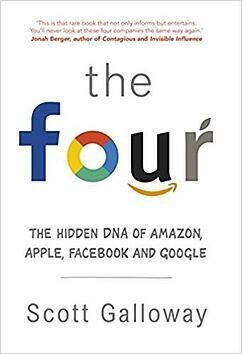 Scott Galloway is a NYU professor and his authoritative and badass attitude can be easily observed in The Four. Scott Galloway is not buying what these four giants are selling, nor does he forgive them their sins. Rather than accepting the pedestal we have put them on, he asks fundamental questions. Most importantly, can anyone challenge them? So for anyone remotely interested in the digital world, this book is a must read. It is not for the fainthearted of course, and Scott's irreverent, brutish style isn't for everyone. But for those who enjoy a passionate and punchy read (and don't mind a bit of adult language) this book will tear down the wall between giants and humans. For this episode, we chatted to Scott about The Four, what he predicts for the landscape in 2019 and what new projects he has lined up. Despite their undeniable power in our current cultural landscape, Scott is confident that The Four can be broken up. This won't be happening tomorrow, or even next year, but if enough people begin to rally against them it could at least bring them down a peg or two. A lot of people would say...the world is what is, these firms are too powerful and because of network effects you need big companies. But my belief is the world is what we make of it and if we decide to break The Four up, we absolutely can. Scott's firm, L2 inc was recently acquired by Gartner and we couldn't resist getting him to dish on the new arrangement. While staying predominately diplomatic about the acquisition, he did express frustration at working for somebody else and the inevitable bs you experience as an employee for a big company. We threw in a cheeky game game of Shoot Shag Marry for good measure. Scott's choices -- Jeff Bezos, Mark Zuckerberg and Sundar Pichai. Stay tuned for our upcoming chat with Scott Galloway about his upcoming book The Algebra of Happiness: Notes on the Pursuit of Success, Love and Meaning - available for pre-order.